Enjoy movies/music/games outsidedoor in sunshine or breeze! Enjoy your favorite movies at will in car! Online-Video Study or Watch movies or Play games, let the kids more happy at home! ►【Good for travel】:Build-in long lasting Rechargeable Battery, lasts up to 5 hours. you can enjoy your favorite movies on the go for longer. Rotates 270 degrees and flips 180 degrees for a great view from any angle. 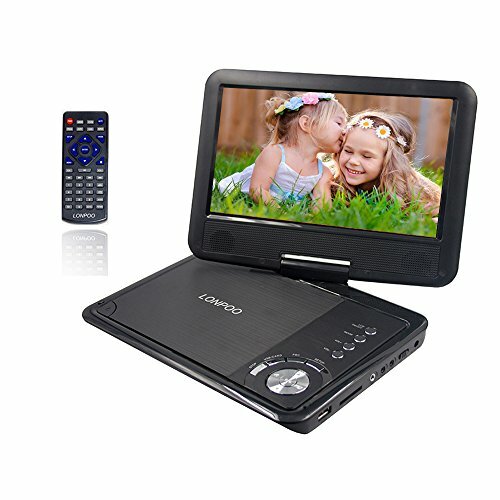 It can be flipped into a tablet style for comfortable use in the car when you are on road trips. ►【easy to use】: Eye protection function，anti-shock function, Multiple interface options，SD Card Slot and USB Port , AV OUT / IN, Game USB, headphones are available.So that you can also easily enjoy your digital media. Tip: A maximum of 32 G is supported. ►【Game Function】:Equipped with Game USB interface for game joystick, provides an additional entertainment of games. If you have any questions about this product by LONPOO, contact us by completing and submitting the form below. If you are looking for a specif part number, please include it with your message.